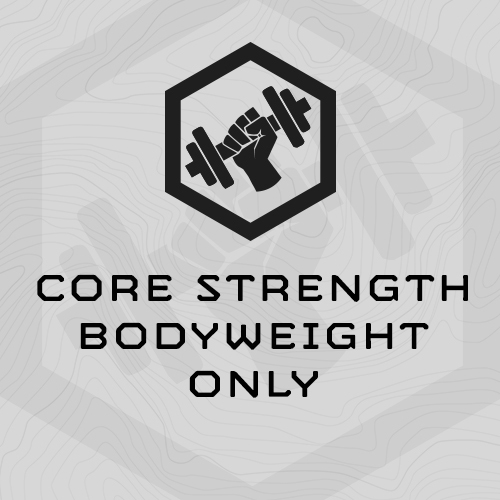 Core Strength Bodyweight Only is 5 day/week, 7-week training cycle focused on midsection strength. The training sessions are designed to take 30-40 minutes, can be completed in isolation, or can supplement other training. This is Version 2 of the plan, updated October 2018. This training program deploys three separate bodyweight-only, core strength assessments, Alpha, Bravo and Charlie, and bases follow-on progressions based on your assessment results. In this way, the program automatically “scales” to your incoming fitness. As your fitness improves, the plan automatically “scales” to your improvement and keeps pushing you. Each assessment includes a bodyweight core strength flexion, rotation, extension, and isometric exercise. How long will these sessions last? Sessions will take 30-40 minutes. How to get your reps for Part (5). Say our Max Rep Sit Ups from part (1) was 60 reps. 30% of 60 (.3 x 60) equals 18. So for part 5, do 18x Sit Ups each round. This is a Grind, "Grind" = work steadily, not frantically. It's okay to rest and break sets in necessary. ** Use your results from SESSION 1 assessment to calculate the reps for Parts (1)-(4). Example: Your Max Rep Sit Ups from SESSION 1 was 60 reps. 35% of 60 (.35 x 60) equals 21. For Part (1) today, set a repeating, countdown timer to 75 seconds. On "Go" complete 21x Sit Ups as fast as possible. The faster you finish, the more time you get to rest before the next round begin. It's okay to stop and rest and break sets as necessary.